Read about it in the preview, and please clickerdeeclick "Download" on the left if you wish to use it! I KNOW IT SAYS CAPCOM in the preview, while it's supposed to be Namco. My sincerest apologies, my head is springing from one thing to the other and I'm not paying much attention. Just ignore it! Journal CSS's can only be used by DeviantArt Subscribers. 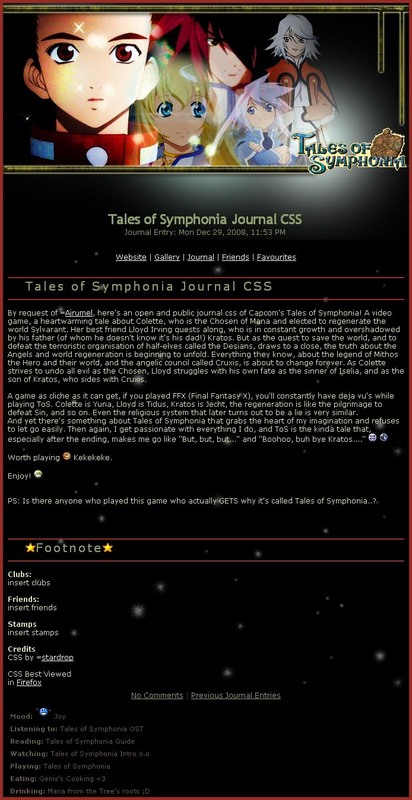 ToSjournal.txt goes into the Journal box, ToScss.txt does into the css box, and ToSfootnote goes into the footnote box. Just copy and paste. A .psd is a Photoshop file. My name's usually in the top (left it out at this one), because I made them. 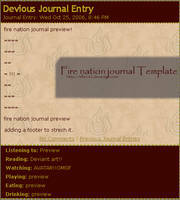 Change it by opening the title.psd in photoshop and edit the text layer, then replace the journal.top image. YOU NEED WINRAR TO DOWNLOAD THIS. I get this too often, too... It's a package containing multiple files, please download and install Winrar if you wanna use my journals. Just google it "Winrar". Done in a heartbeat. No, please don't touch the credits. Thanks. 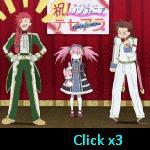 Tales of Symphonia (c) Namco. It's called Tales of Symphonia because the party members -- members who are as different as can be -- come together to work in harmony, thus coming together like a "symphony." That, and the reunion of the worlds, is why it's called that. it wnt let me download!!! could you possibly send me the stuff in a note? I think... they might have named the tree Symphonia? Maybe? Well, I usually don't get the Tales of titles. I've used it in my journal. I usually only make csses of games I've played myself, or series I've seen... And I haven't played it, no I wouldn't make one.. You could send me a note with it as a personal css request, though I hardly find any time to do any requests, sadly. Aww D: I'm sorry for taking up your time. I wish you could play it xD It's a great game! I actually do wanna play it, I've seen previews and such, and it looks very interesting.. One day, probably. Oh! They made an anime out of it actually. You can find it online, and its not that long at all. Ohh really!? I knew they made one of Symphonia, but Abyss too? *googles* Thanks! No problem! 8D Now you can experience Jade's ANIMATED epicness. SCOOREEE! I haven't played ToS2 yet, so I don't really have the right feeling of making it But thanks, anyway! Haha no problem, thanks for using! ^^ Thank you for making! First of all, you need Winrar to open the file. 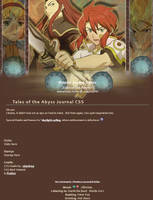 Secondly, you need to be a dA subscriber to use journal css. And thirdly, there's no way I'm gonna explain to you how to make 'these thingys'. You can learn it yourself by starting out here: [link] Next to that, we also have a wonderful forum where you can ask for sources. I want to eat this one. But i've been sitting here for about an hour, my order hasn't come. Okay, and I'll be watching to see it! I'll have to get the program when I'm at school, unless you could e-mail it to me. I'll email the files to you. But I'll need your adress. Really? Awesome! I'll note it to you right now! Yep, thanks! I'll put it up when I write my next journal!